A Spherical Display really is a different world than the flat displays so common in our lives. When viewers first encounter a beautiful digital globe, they are enthralled. Whether the purpose is entertainment or education, you have their attention. They should be your audience, your visitors, your students, your colleagues. Image dispersal using patented convex mirror with internal single or dual HiRes projectors inside the system. Matte finish screen for natural appearance - No room reflections, easy to clean surface, doesn’t show fingerprints. Proprietary screen treatment for large contrast enhancement. Suggested Light Ambient: 10% of effective screen illumination or less (compare to above). This depends upon nature and character of displayed graphics. Data listed above for the 48” and 60” sizes are based on Dual Projector systems. Single projector configurations are also available. 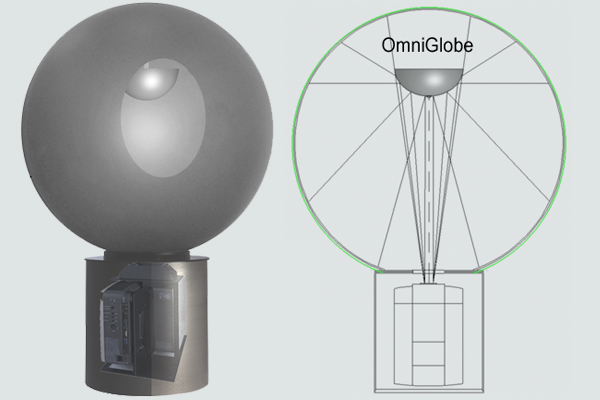 When to choose an OmniGlobe® and when Science On a Sphere®? An OmniGlobe® has a diameter between 80-150cm. For sizes above 100cm-150cm we highly recommend the use of a dual projector OmniGlobe®. Single digital globe projector systems basically use only SXGA+ projectors and are limited to about 0.9 Mio pixels on the screen while dual projector systems can utilize 2x HD projectors with a very good result of about 2.9 Mio pixels on the screen which is a more than three times higher resolution. For comparison sheets please contact us. 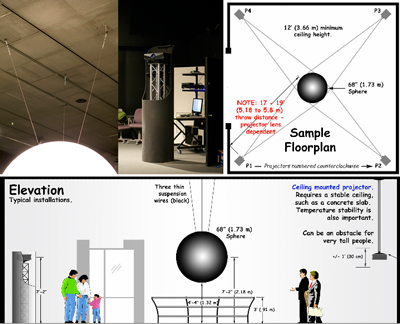 When it comes to diameter sizes above 150cm four or even six projectors are possible/necessary to get a good picture result, and that is only possible with Science On a Sphere® outside projection systems. How dark should the viewing environment be? Typical museum lighting is fine. Such lighting is subdued, but easily adequate for “reading a newspaper”. The screen has a low reflection matt surface, but bright lights will reduce the image contrast. For a relatively bright environment, and anywhere the extra “pop” is wanted, we recommend our Dual Projector System. Is it OK for people to touch the screen? Yes, but we don't recommend encouraging it. The screen consists of a soft vinyl rear projection film bonded to an acrylic shell. The vinyl has a matt finish that does not readily show finger marks, but it can be scratched and gouged. Cleaning should be infrequent, but when required any non-aggressive cleaning solution (slightly soapy warm water, alcohol, etc.) can be used with a cloth or soft paper towel, etc. How fragile is the screen? Not very. Structurally, the screen is an acrylic spherical shell. It isn't easily broken, but contact with objects that might deliver a sharp blow or gouge the vinyl should be avoided. Damage to the vinyl cannot be repaired, so depending on the environment it is to be installed in, it may be advisable to install a protective railing around the OmniGlobe®. What is the best viewing distance? Just as in a movie theatre, the best seats are not in the front row. 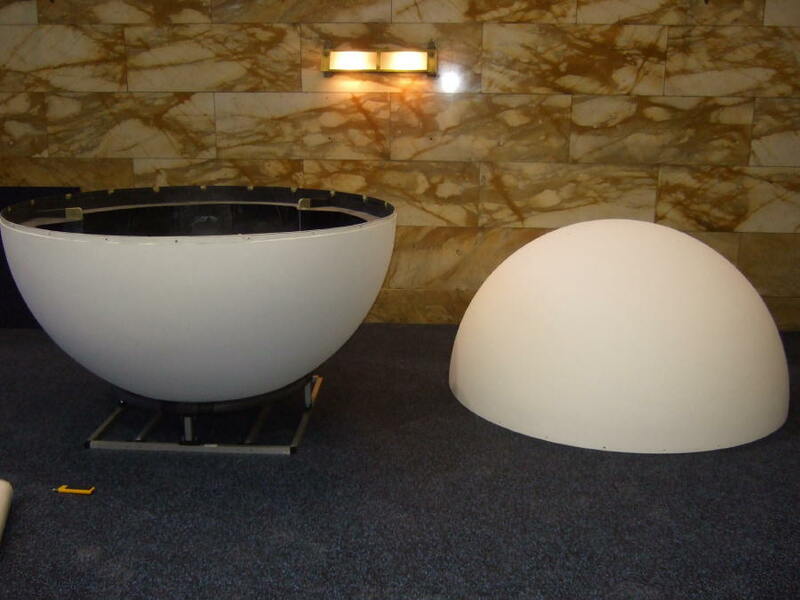 For the fully spherical OmniGlobe®, a comfortable viewing distance is about twice the diameter (10 feet for the 60” globe and 4-5 feet for the 32” globe). Who besides Globoccess creates content? Please see OmniSuite column or Content in our homepage. Can we have multiple movies or images on our OmniGlobe®? Yes. And they can be set up to be selected by visitors or staff. Visitor selection is typically accommodated using a touch screen monitor. Movies can also continuously loop. Yes. Audio is easily added to movies. What hardware do the movies and images play from? A PC configured for good video performance, which is generally included in the price. The software, images and movies will reside on the hard disk. The PC generally resides inside the base of the display system, although it can also be located in a kiosk or some other location close by like a computer control room. Depending upon the projector, they are generally rated at 1500 to 2000 hours in standard power mode, and as much as 4 times that in the economy mode (low brightness setting) available with some projectors. What are Globoccess warranty and service policies? 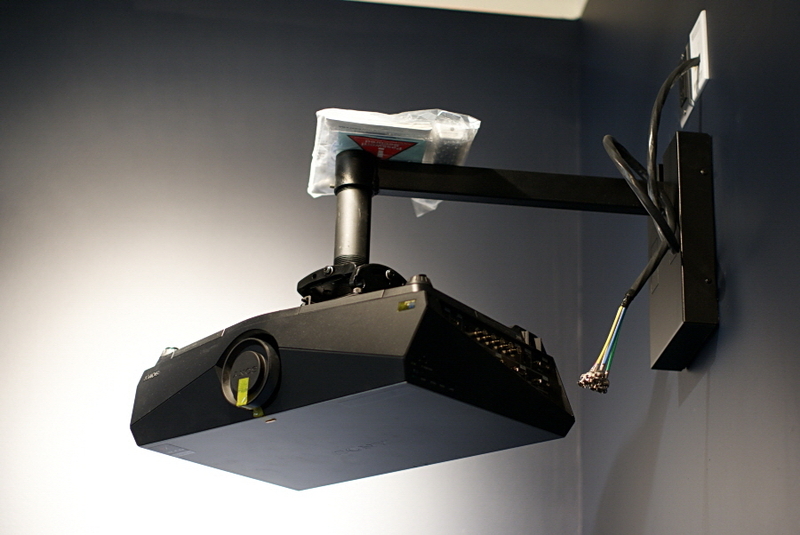 The projector and computer are standard products from reputable suppliers like Panasonic, Projectiondesign, Dell etc and are covered by their respective manufacturer's warranties, generally 1-2 years on parts and workmanship. Globoccess warrants the rest of the system, which is principally the screen and optics, for one year for problems or failures due to workmanship or materials, and which are not intentional or inadvertent damaged caused at the installation site. Science On a Sphere® systems consists of four projectors positioned along the sphere’s equator and as an option up to two additional projectors for North and South Pole regions, depending on possible viewing angles and room environment of our customers. 1 Custom globe sizes possible. What is Science On a Sphere®? 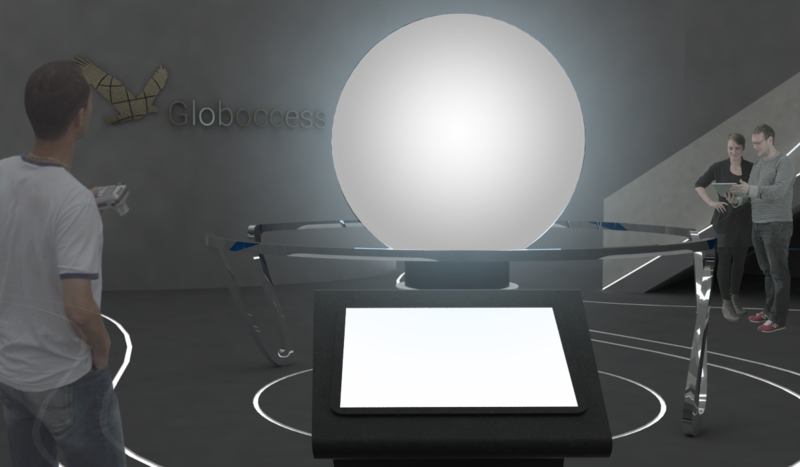 Science On a Sphere® is an animated globe and visualization system. 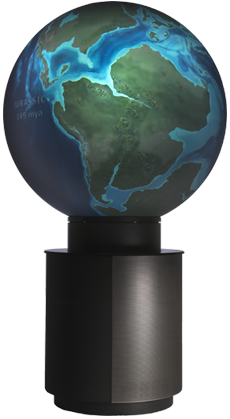 As well as an OmniGlobe® it is mainly used to imitate the planet Earth in a dynamic way to display all environmental processes like climate change or natural moving or even real time content like hourly updatable clouds or real time GPS data, or combinations of these. Besides these possibilities it can also be used as a 360-degree-visible media tool for modern company communication in public places like lobbies or any large rooms by using advertisement movies, animated company location overviews or art. Why Science On a Sphere®? 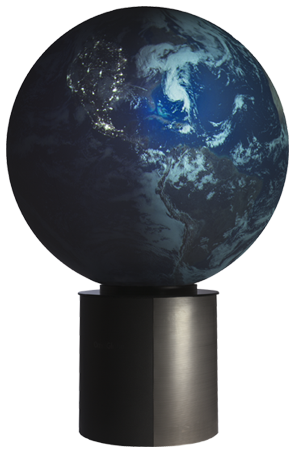 At the moment we offer 173cm and 300cm globes - custom sizes are possible. The hard shells can be delivered in two pieces to meet possible access limitations on the final site. The seams are invisible once installed. What hardware is used for a Science On a Sphere®? Science On a Sphere® consists of a spherical screen made of carbon fibre with a typical projection surface. 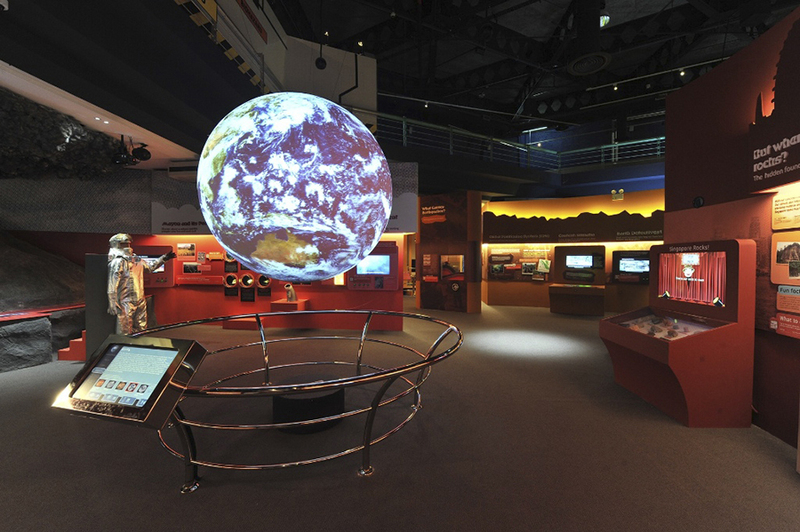 It uses 4 high-end video projectors, depending on customer’s needs or size of the Science On a Sphere®. All projectors are driven by one computer. An additional computer is used as a spare. 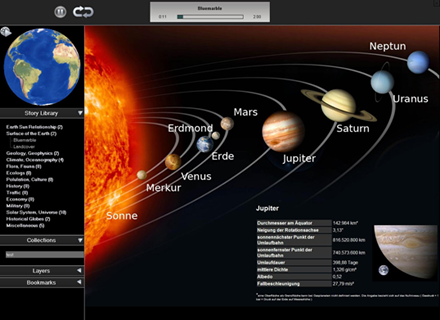 OmniSuite is responsible for projecting and rendering the content in real-time according to user interactions and the used globe system. OmniSuite's authoring module provides tools for content creation from simple to highly sophisticated. You can easily create your own content (global story) within a few minutes or choose from our story library. A graphical presentation and interaction system allows you to manipulate the ongoing demonstration in realtime via graphical user interface (GUI). You can use some of our GUI templates, alter them or design your own GUI. There are many possibilities for the contents. Most of it is available for free in the internet. Some are limited by copyright restrictions or cost extra. 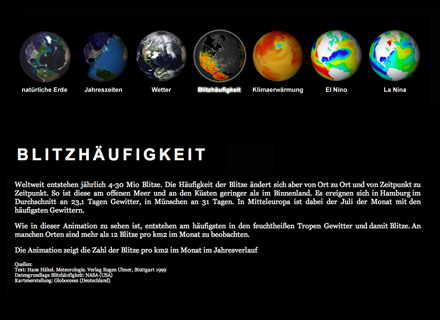 Create your own living planet or choose from our scientifically structured content overview. Can movies have audio effects? What tools are available to help create visualizations? Also, there is a tool with OmniSuite for creating and managing your content (global stories). It is a GUI-based application that makes creating new and modifying existing global stories easy. Using OmniSuite’s StoryEditor/MaterialEditor, you can open global stories, drag and drop stories between computers, modify story entries, all through a simple graphical interface. Our smallest globe even fits through standard sized doors. Perfect for schools. Our personal favourite. This Globe has a very sharp and bright image - an unbeaten picture quality. This large globe has a lot of presence. Our powerful software package provides all tools you need to tell your own global stories. High image quality for big spheres. Perfect for halls and lobbies. High image quality for big spheres. Perfect for big halls and lobbies. Also over multiple floors.